The Hatfield House Chamber Music Festival is now into its 7th year. The 2018 Festival celebrates ‘Brahms and Friends’ and will feature music by Brahms, Mendelssohn and Schumann. The singers of Hertfordshire Chorus are delighted to have been asked to return again to sing Brahms’ Ein Deutsches Requiem in the Finale concert on Sunday 23rd September 2018 at 8pm. The Chorus will take to the stage with a marvellous line up of internationally acclaimed performers –Ailish Tynan, Soprano,Ben McAteer, Baritone, the Faust Chamber Orchestra and conductor Mark Austin. The concert will take place in the Banqueting Hall of the Old Palace. John Morton the Bishop of Ely built The Old Palace around 1485. The remaining wing contains the Banqueting Hall, which has most of its original roof timbers. Interestingly, many of them are peppered with gunshot. This is because when the building was later used as a stables trespassing sparrows were shot at as a discouragement. Henry VIII bought the Palace in 1538 and his three children enjoyed a happy childhood there. Later Queen Mary kept her sister, Elizabeth I under house arrest at Hatfield. 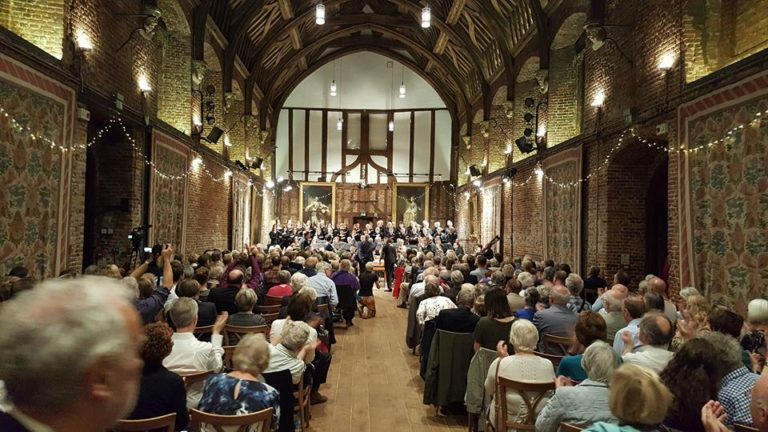 Hertfordshire Chorus has been privileged to sing at Hatfield House on many occasions over the years. History right on our doorstep! You can read more about this concert and buy tickets here.